I love when my time online translates to learning the little tricks that social media platforms have but don’t often advertise. And I definitely love when I can share these new features with my clients and other busy business owners like you. These tricks make social media a little more FUN for everyone out there who has little time to really dive deep into online platforms. 9 tricks that make social media a little more fun for everyone out there. 9 tricks of social media that you might not know about (but will be happy to start using)! 2. Create a playlist on Facebook of your YouTube videos, Periscope Videos, Family Videos and more. Head to your Facebook Main screen, click More (it’s on the right side of the tabs under your header) and then click on create playlist. Now people have instant access to your YouTube feed or Periscope Videos, it’s a great way to organize all of your content, drive traffic to other areas of the web that are all about you, as well as preserve those family memories you want to keep handy. 3. 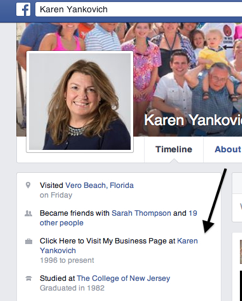 Use your Facebook Personal profile to lead people to your business – no matter how private you like to keep it. I totally understand the want to keep your personal profile on Facebook locked down and very private. In this day and age though people interested in your business and what you have to offer will very likely search you out. So feel free to keep your personal profile locked down except for one tiny section: your work/position information to the left hand side on your timeline screen. Make sure you change the privacy settings to Public. Even if the rest of your page is private leave this one section as Public so everyone viewing can click through to your business page. 4. Analyze a search term or hashtag on Twitter. A fun site called Topsy.com helps you do this. Enter a search term in the search bar and you get to see numbers of tweets mentioning this term from 1 hour to 30 days out, the most recent or most popular, and topsy even gives you a “sentiment score”. I searched the ever popular “cute dogs” to see what information I could glean. And as you can tell, cute dogs is still a popular subject. But of course regardless of what keyword you search much can be gained by knowing who is talking about these terms in your niche, why they are talking about them, what they are saying exactly and how often. 5. Organize your social media via Twitter Lists. Create a private list for your clients, your current partnerships or future want-to-be business partnerships. I keep all my lists private because Twitter sends a notification when you are added to a list. From these lists on Twitter that you create you can easily share the word of your clients and others who are important in your business circles. I follow over 24,000 people, and to search through that to get to a Tweet I want to share from a client would take some time. Using my Twitter list I can quickly share, retweet, and favorite all sorts of great content that people in my niche are talking about. It’s good for me, and it’s good for them, a win-win! To create a Twitter list just click on your profile Icon in the top right of your home page and then click list! From there you can create and add at will. 6. After you connect on LinkedIn create a custom TAG to organize your connections. With 500+ or even 50+ connections it’s easy to get the names, organizations, and reasons for connecting lost in the shuffle. LinkedIn allows you to create a little “cheat sheet” to help you with this. Once you connect with someone go to their profile page, click on the star icon just below the blue Connect button. From there you can add notes about who they are, how you met and when, what you want to follow up on with them, as well as create tags (sort of like how I create and use Twitter Lists) to place them in a group based on how and where you want to further this connection. 7. Don’t just LIKE a Facebook Business Page, make sure you receive their notifications. Liking a business page these days does not guarantee you will get their updates so you have to go one step further. Head over to a business page on Facebook that you enjoy following and hover over the Like Button, click on the down arrow and then click on Get Notifications. This step is important because now you can share their posts, be more active and visible on social media, and serve those businesses that you feel deserve to be known. So go ahead and think about what businesses you want to engage with, head on over to their Facebook page and get their notifications! 8. Customize your LinkedIn Public URL. When you sign up for LinkedIn you are given a generic URL filled with letters and numbers. But you can change it to a custom link that looks very professional that you can use everywhere! Go to your profile and click on the little pencil icon that is next to the URL under the blue View profile as button. From there you can change this URL to anything you want! Do this now and then add the new link to at least one of your social media bios! 9. Finally do you ever want to add bold, italics, or underline emphasis to your posts? As someone who is an enthusiastic speaker and because I write how I speak, the inability of most social media platforms to do this easily sometimes drives me crazy! (And causes the use of excessive exclamation marks.) You currently can only use a Unicode Text Converter to do this at this time – similar to how we add symbols to our LinkedIn profiles. But here is a little known fact of Google+ platform: Surround any text with asterisks to turn the text bold, with underscores to make it italicized, or with an underscore followed by an asterisk to make it both bold and italicized. Do this to add a little punch to your posts! 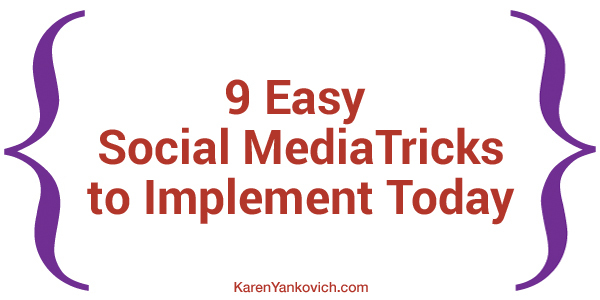 So there you have it – 9 social media tricks that many people might not know about. Try one today and share with all of us in my LinkedIn Group (please join if you haven’t) which one you tried! Karen – as always, more useful tips to enhance our posts. Thanks. Yay! I love that you love the 30 day challenge. Thank you so much for these tips! I tried the Facebook notification, but I had to stop about 2 days later because I was getting them CONSTANTLY. So I created a list under “interests”. That works much better for me, because I see all the food blogger posts in one spot.